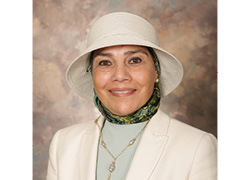 Dr. Hoda El-Sayed is a Professor in the Department of Computer Science at Bowie State University. She is the founding director of the Center for High-Performance Information Processing (CHIP), a BSU interdisciplinary high-performance computing research center, which is the home to the BSU state-of-the-art Cray-XC-40 Supercomputer (Sphinx). Dr. El-Sayed’s research interests include Parallel and Distributed Algorithms, High-Performance Computing and Applications, Parallel Processing Systems, Computer Architecture, and Programming. She received her M.Sc. in Computer Science from New Mexico State University; and her D.Sc. in Computer Science from The George Washington University. El-Sayed has published many refereed research articles and her publications appeared in prestigious venues such the IEEE Transactions and the IEEE International Parallel and Distributed Processing Symposium (IPDPS). Prior to Bowie State University, Dr. El-Sayed has also taught at George Mason University, The George Washington University, and served as a visiting faculty at Virginia Tech. In addition, she was a researcher in the High-Performance Computing Division at the National Institute of Standards and Technology (NIST). Dr. El-Sayed has served as a reviewer for reputable publications venues including IEEE Transactions on Computers, Journal of Supercomputing, and other conferences. She has served in many leadership roles in visible conferences and symposia including Workshop Chair for the 20th IEEE International Conference on High Performance Computing and Communications and Local Arrangement Chair for the 18th IEEE/ACM International Symposium on Cluster, Cloud and Grid Computing. Dr. El-Sayed’s research has been supported by Federal agencies including the National Security Agency and Department of Defense. She received many national and international awards and recognitions including University System of Maryland Board of Regents’ Faculty Award for Excellence in Innovation and Bowie State University College of Arts and Science Outstanding Faculty Achievements Award. Dr. El-Sayed is an IEEE Senior and a member of the Association for Computing Machinery (ACM).